Hyder Ali Bohra, Age 21 years (married), student of F.Y.Se. Asghar, (Photo published in newspapers). Rafiq Dada, Age: 12 years, High School student. Ghulam Rabbani, Age: 12 years High school student, Punjabi Guardians in Navy, Keamari; parents in Punjab. Man Sukh Lal, Age: 15 years, IX or X Class, BVS Parsi High Scnool, Pak Scout, came to help the injured. Bullet shot at cheek piercing through the head on Jan. 8. Had reached Crescent Trad­ing Co. Address Nanakwada, Guardians: mother and elder brother. 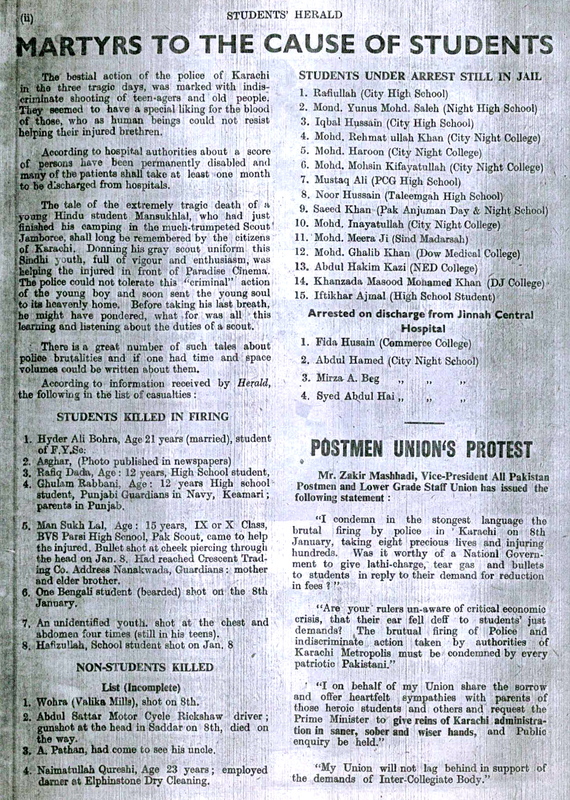 One Bengali student (bearded) shot on the 8th January. 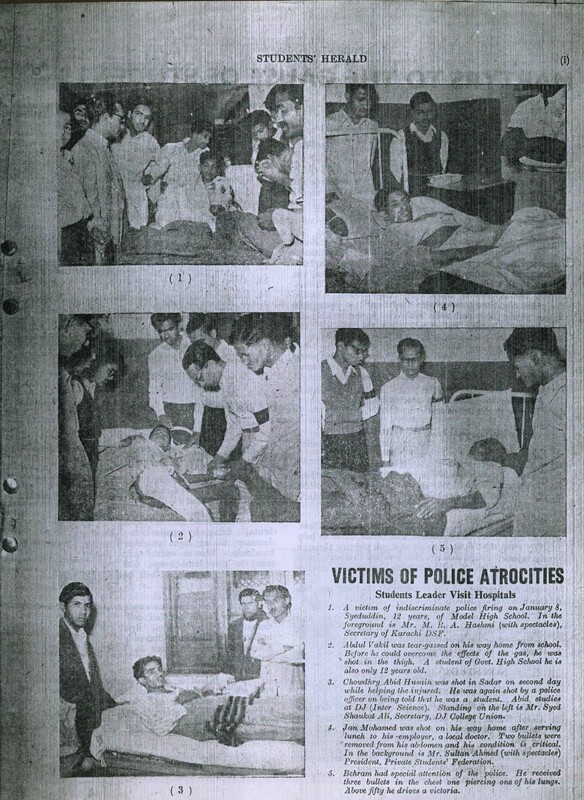 An unidentified youth shot at the chest and abdomen four times (still in his teens). Wohra (Valika Mills), shot on 8th. Abdul Sattar Motor Cycle Rickshaw driver; gunshot at the head in Saddar on 8th, died on the way. A Pathan, had come to see his uncle. Naimatullah Qureshi, Age 23 years; employed darner at Elphinstone Dry Cleaning. I was 8 but remember my father telling to my mother the brutal act of establishment the commissionar of Karachi and his brother then chief of police, killing the student at target and showed his hatred . In every dacade the same story is being repeated.